DoubleTree Hotels had a poorly defined image and a middle-of-the road positioning. Catering primarily to the business traveler in the western United States, DoubleTree was mired between the less expensive chains (Embassy Suites and Courtyard by Marriot) and the more up-scale hotels such as Westin and Hyatt. Committed to building the franchise into a national player, DoubleTree began focusing on better differentiating the brand in the marketplace while expanding into new geographic regions. 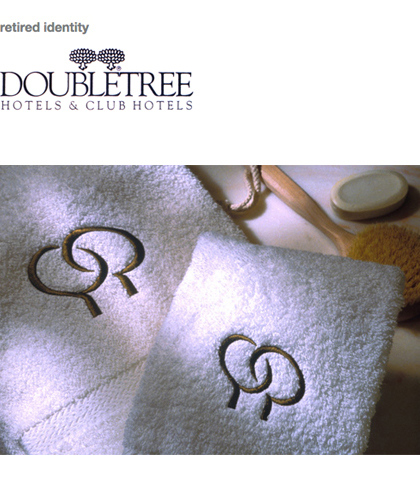 The new, simplified and understated DoubleTree symbol builds on the equity of the twin trees and better connotes the connection of the Hotel to its customers. The interlocking trees also heralded the merger of Doubletree Hotels and the east coast’s Guest Quarters Suites, under the now national DoubleTree brand.